It’s one of the more dubious automotive honors. And this year there’s a new champ. The most stolen vehicle is now the Ford (F) F-250 pickup, a heavy-duty version of the top-selling F-150 that’s popular with contractors. The F-250 displaces the Cadillac Escalade, which was the most stolen vehicle for six years in a row before this year. The Escalade fell to sixth, which must be a relief to Cadillac executives who don’t count car thieves among their target market. Ford F-250 Crew model with four-wheel drive (starting price, $36,270), seven out of every 1,000 insured vehicles stolen. Chevrolet Silverado 1500 Crew model ($32,710), 6.7 vehicles stolen. Chevrolet Avalanche 1500 ($36,975), 6.1 vehicles stolen. GMC Sierra 1500 Crew model ($35,885), 6.1 vehicles stolen. 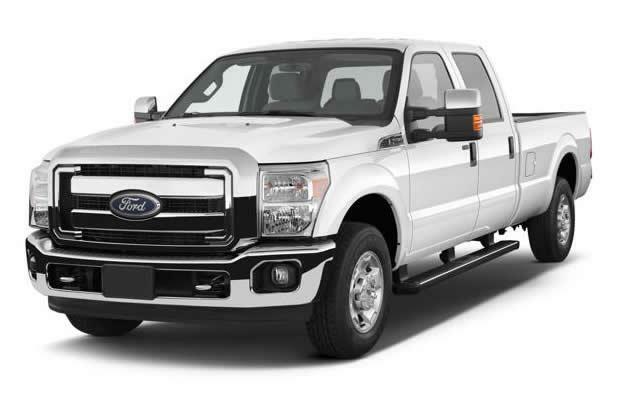 Ford F-350 Crew model with four-wheel drive ($37,370), 5.6 vehicles stolen. Cadillac Escalade with four-wheel drive ($67,290), 5.5 vehicles stolen. Chevrolet Suburban 1500 (45,360), 5.4 vehicles stolen. GMC Sierra 1500 Extended Cab model ($28,610), 4.7 vehicles stolen. GMC Yukon ($41,760), 4.5 vehicles stolen. Chevrolet Tahoe ($41,400), 4.4 vehicles stolen. It’s not a coincidence that the models most popular with thieves are all pickups and large SUVs. Those models tend to be expensive to start with, so they’re worth the most to seasoned burglars aiming to chop them up for parts and sell them on the black market. Thefts may also include expensive tools and other gear stolen from the vehicles and truckbeds, if an insurance claim is filed; the data don't differentiate between stolen vehicles and stolen stuff. Thieves also tend to target vehicles that don’t have anti-theft features such as an engine immobilizer, which prevents thieves from hot-wiring a car. The Escalade has long had an engine immobilizer, but thieves would get around that by towing the Escalade away or loading it onto a flatbed truck and carting it off. To defeat that, Cadillac installed new anti-theft devices such as a sophisticated steering lock and an “inclination sensor” that sets off an alarm when the vehicle is tilted upward, as when it’s being loaded onto a truck. That, along with the Escalade’s declining popularity, probably accounts for the drop in thefts. The F-250 also comes with a standard engine immobilizer, so Ford may end up looking into new anti-theft devices as well. Immobilizers were standard on 89% of cars sold during the 2012 model year. Toyota Sienna (starting price, $26,585), 0.5 vehicles stolen for every 1,000 insured vehicles each year. Jeep Compass ($18,495), 0.5 vehicles stolen. Dodge Journey all-wheel drive model ($26,495), 0.4 vehicles stolen. Volkswagen Tiguan four-wheel drive model ($31,425), 0.4 vehicles stolen. Audi A4 $(32,500), 0.4 vehicles stolen. Acura RDX ($34,520), 0.4 vehicles stolen. Toyota Matrix ($19,275), 0.4 vehicles stolen. Lexus HS 250 (discontinued), 0.4 vehicles stolen. Honda CR-V ($22,795), 0.4 vehicles stolen. Hyundai Tucson ($20,595), 0.4 vehicles stolen. For car buyers, it might be tempting to consider a vehicle that’s least likely to be stolen, but it’s worth keeping in mind that thieves probably ignore some cars because they’re not worth much. The Matrix, for instance, is the neglected stepchild in Toyota’s lineup, lacking the refined touches that typify most other Toyotas. So there may simply be little demand for its parts. Lexus stopped selling the HS 250 because of poor sales. And the Dodge Journey and Jeep Compass are weak sellers that will soon be discontinued as well. The best way to defeat car thieves may be simply to buy a vehicle nobody else wants.